plā′wėrk′ings, n. Portions of play matters consideration; draft formations. There’s a lush spread for breakfast at the hotel: perhaps it’s a smörgåsbord! 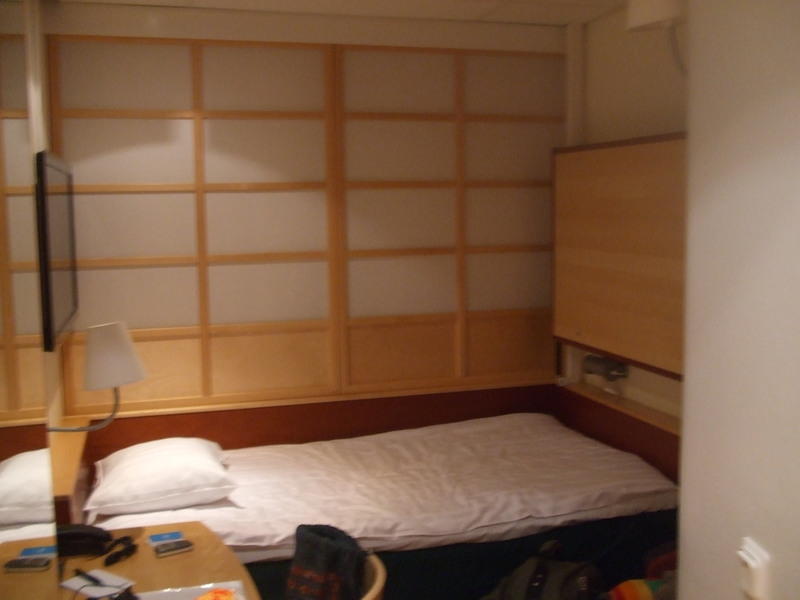 Sleeping, or rather waking, in the cubicle room is a strange experience – I wake but don’t really know what time it is because there’s no light or sound to tell me. There’s a very dull, dim and distant traffic noise, I think, but it could just be hotel air conditioning noise. We duck out just round the corner to T-Central, off of Kungsbron, and wend our way towards Thorhildsplan, where we’ve arranged to meet Eva at the University campus, but there’s a train broken down and we have to detour: the Stockholm underground isn’t so difficult – three lines, red, yellow, blue, and you can work out easily where to go. It’s not so big. The breakdown doesn’t seem to cause too much problem: people just get on with it, find alternatives. Eventually, we find Eva at the University and we’re given a talk by Malin Rohlin, head of the institute, about the history of childcare in Sweden. I piece it together: the work cottages of the 1800s (social training for the poor) to the system here today (social competency). It seems that ‘fritidspedagogues’ (perhaps roughly equivalent to our teaching assistants) work from 8am to 1pm or 2pm in school, then they just carry on, after the teachers have finished, with the supporting of the children’s play. It’s much more fluid than our system. ‘Socialisation’ in Sweden has a positive connotation not a negative one. Later, at the school we visit (Sköndalsskolan), past Södermalm, south, I see staff in casual wear, t-shirts and the like, interacting with the children with respect, and quietly. Kaspar, a staff member, is dressed in black with dark glasses and long hair. He reminds me of a stereotypical biker. Sven, the music teacher, is passionate about his subject and he has rooms in what is, loosely, the youth club area for 10-12 year olds. Sven is proud to tell us of the children’s musicianship and plays us what the children have created. It’s hard to get down on paper but he just hangs around after school and the children do what they want to do in what he calls his ‘music jungle’ (the room has plenty of plants, drums, ukuleles, guitars, keyboards). It feels right. The whole place feels right. The classrooms are clean, though not cluttered with children (perhaps because the day we’re visiting is the national day to celebrate the child and they’re mostly all outside in the playground, playing). 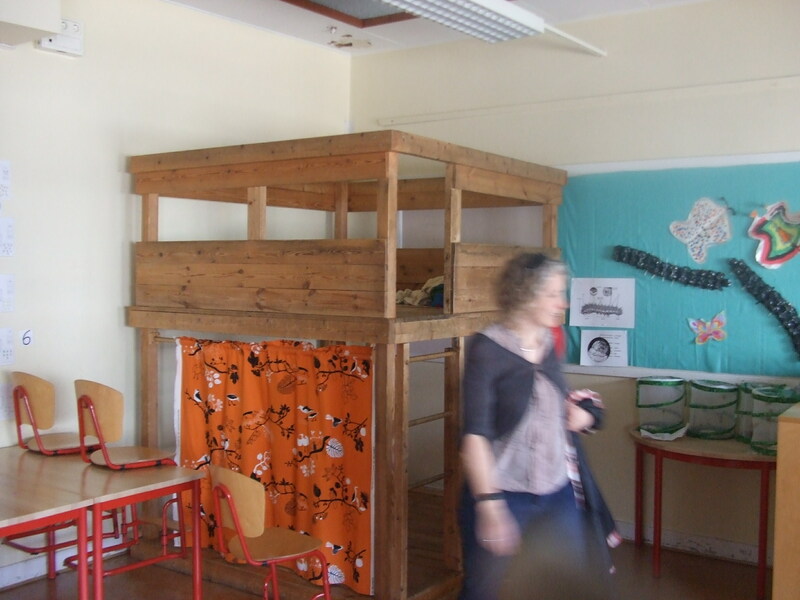 One of the classrooms has its own built-in platform den. It’s a small touch but, I think, a notable one. We’re shown a series of classrooms by fritidspedagogues but, after a while, a classroom is a classroom. A Somali-Swedish pedagogue catches my attention. I watch her knelt down with a small group of children, putting shoes on or the like, in the background. She’s quietly spoken. She looks up and knows she’s being watched, searches us out and smiles expansively. Eva travels with us, by bus and train, back to Slussen and leaves us with promises to meet up again tomorrow night. The women of the group head off to the ferry towards Skansen on the island of Djurgården. Rich and I have had our fill of walking and ‘doing’ though – we walk off towards the T-bana again and head one stop up the underground to Gamla Stan in search of beer. We find a pub full of Germans: a dark place on the corner of Stora Nygatan and Gåsgränd. We drink outside and hang the price. We talk and watch the people go by. We head off in search of more beer, not really knowing where we’re going, ending up on Vasagatan, reflecting again on ‘averageness’ and the relative positives or negatives of the Swedish way of things. People here just seem vaguely satisfied with their lot: not smug or arrogant or depressed – just averagely OK.
There’s one busker on the underground and it takes a while to realise that this is the first busker I’ve seen. There are some beggars but not so many as to be anywhere near intrusive. People on the underground just go about their business. My first impressions of Stockholm were that it was edgier than Malmö, but after being here a couple of days it’s not really edgy at all – everything’s relative. Stockholm is comfortable, small enough, big enough, diverse enough, good enough. It’s a ‘good enough’ city. It’s comfortable, a comfortable capital. Yet, it doesn’t seem to have a rawness like other major cities have. Is that a good thing or a bad thing? I don’t know. I sit here now, in the hotel lobby, in the window, on comfortable seating, on Kungsbron, watching people of Stockholm go by: I’m smeared by ingesting strong, expensive Swedish beer and OK-ness. 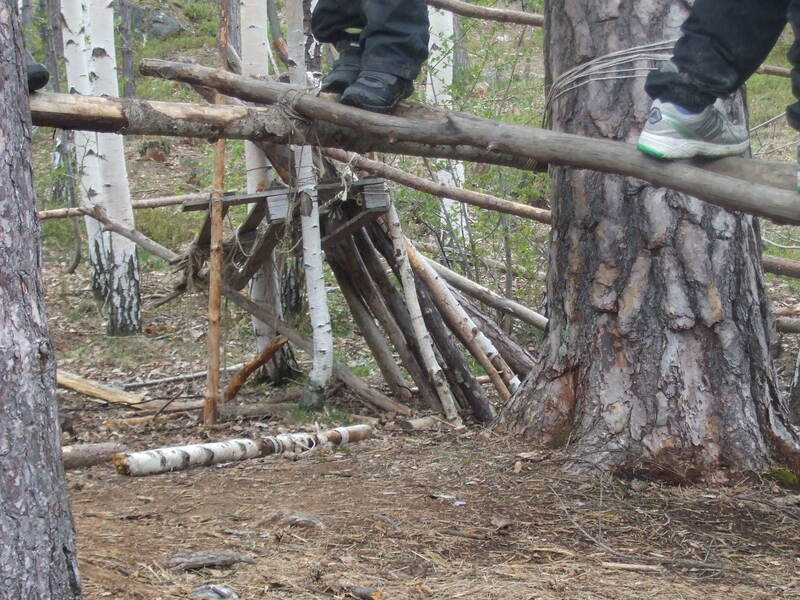 We follow our itinerary to the strange outdoor school on Lidingö island. Eva has looked after us with routes to take. We leave in good time and find our modes of transport. Our notes tell us where to leave the bus and we stand out on the main road on Lidingö having conversations about which way is south and which way north. Perhaps this doesn’t bode well for being out in the forest, as we’re planned to do. We have an address but we walk up and down blind alleys. Eventually, after asking locals, we cross a field that’s adjacent to the boat moorings, and beyond a bluff is the I Ur Och Skur Utsiken Skola base building. As we come down the road, we meet some Swedish children who are ridiculously excited to meet us, hanging out on the platform just above our head levels. The girls squeal ‘Teeeem, Teeeem’ (Tim) as they run off to find the group leader. They must have been given forewarning that we were coming to visit. Tim is a calm man with a way of talking that suggests he knows exactly what he’s doing. Eva had prepared us to come in outdoor clothing: rain or shine we’d be outside today. Some of our group’s clothing may not match up to Tim and his colleagues’ all-weather preparedness. We make our own lunches, as the children have also done, and Tim invites us to join the group around the corner as they all sit down on a wide circular bench. The children sing us a song. When Tim invites each of us to say who we are, I decide to tell the children in Swedish. Soon we’re off on a trek. 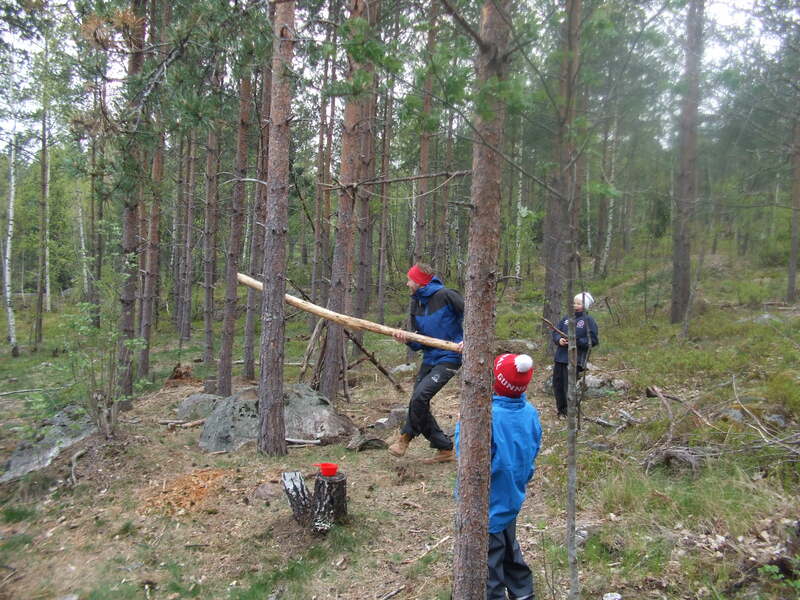 We’re aiming for an area of forest about twenty minutes’ walk from the base. As I’m talking with some of the girls at the back of the walkers, who are already strung out, I start counting my footsteps out loud in Swedish. This, I think, seems to impress the children: maybe not so much my research of their words for numbers, more the fact that I’d bothered to try to speak parts of their language at all. At Sköndalsskolan, in the youth club rooms we visited yesterday, where Sven kept his ‘music jungle’, I was pleased to use my longest and favourite Swedish phrase with some of the children sat at the computer screens, wondering at me. Jag talar bara litet Svenska. They laughed. When we get close to the area we’re going to stop in, I see a steep hill up into the trees. Tim stops to put down the handle of the platform trolley he’s been lugging along. He leaves it there at the base of the hill and he and the other staff load up the stuff for the children’s lessons. They take it all a couple of hundred yards up into the forest. The children are trusted to make their own way. I stand at the bottom and just watch the way one of the children, who’s in a sort of wheelchair, is pushed up the hill by his support worker. I wonder if physically disabled children in the UK always get such due regard to access ‘difficult’ places. The support worker is tireless all day. She really helps this child engage in exactly the same learning and play opportunities as all the other children, across exactly the same steep and uneven terrain. Out in the trees, we observe, join in, are, just with the group. 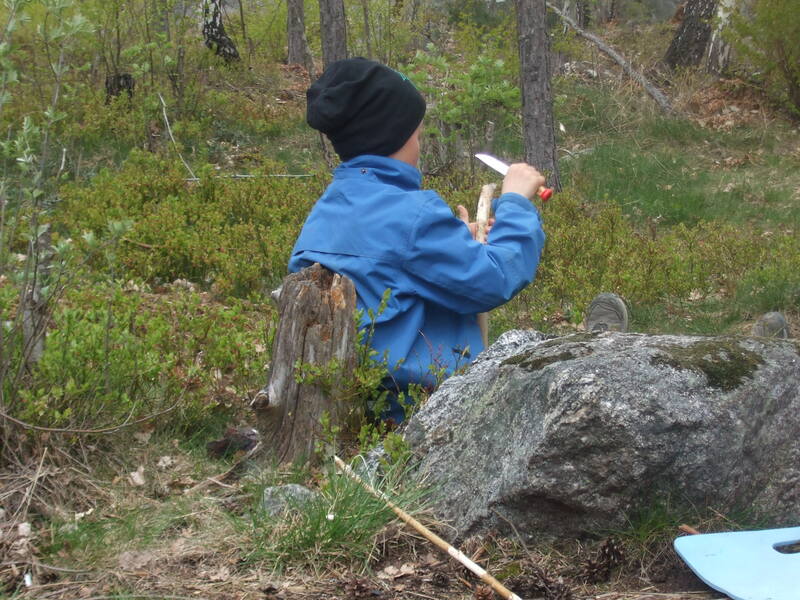 They’re split into three groups and one of the groups – the whittling and making things group – is manned by Frederik. Frederik is the fritidspedagogue, and it shows. I observe him being spontaneously engaged by some of the children in a play frame that requires him to smash fir cones across the forest with a length of wood! None of the other staff seem to pay this any undue attention. The other lessons are to do with using the natural resources to learn about fulcrums and balancing, and about weights and cantilevers. Rich and I watch on, amused, as some of the children seem to get the point of this lesson quite early on and are more interested in eating the wild berries instead. They pick away as they stand or sit around, listening to the teacher. Later, the teachers tell us that the children have known from an early age what’s good to eat and what’s not: so they’re trusted. 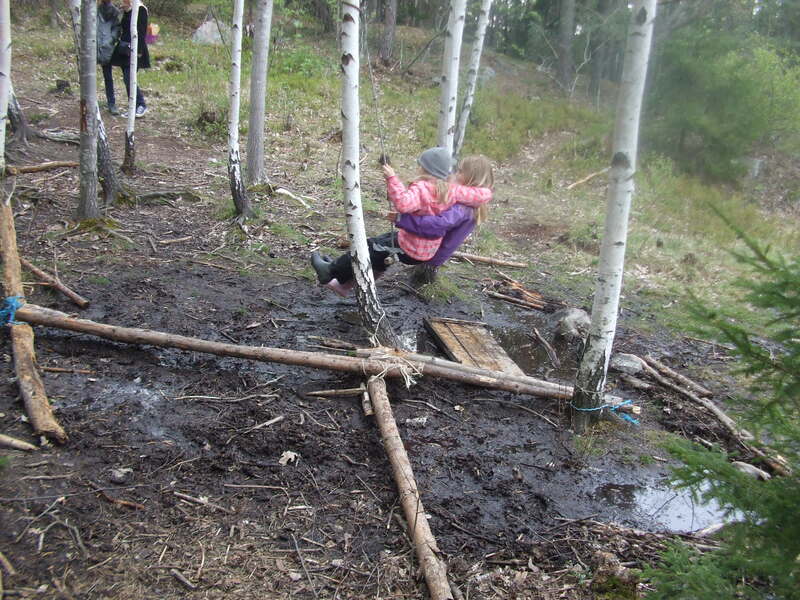 When the learning is done, the children make play use of the rough and ready constructions in the trees. Out of nowhere, two of the girls (about 10 years old) bring me a strip of plaited rope and pine cone offering. ‘For me?’ They say yes and I really don’t know where or why this comes from. I wonder if it’s anything to do with the fact that, earlier, I tried to speak their language. I feel immensely privileged. Later, in the Czech restaurant in Södermalm, Eva tells me that yesterday at the school the children were saying about me: ‘he’s so cool.’ It’s a privilege but I don’t know why I’m seen as ‘cool’. Perhaps because I look different. We walk back with the group and take our leave before we get back to the base building again, saying our goodbyes and climbing up the embankment to the road in the gathering rain. 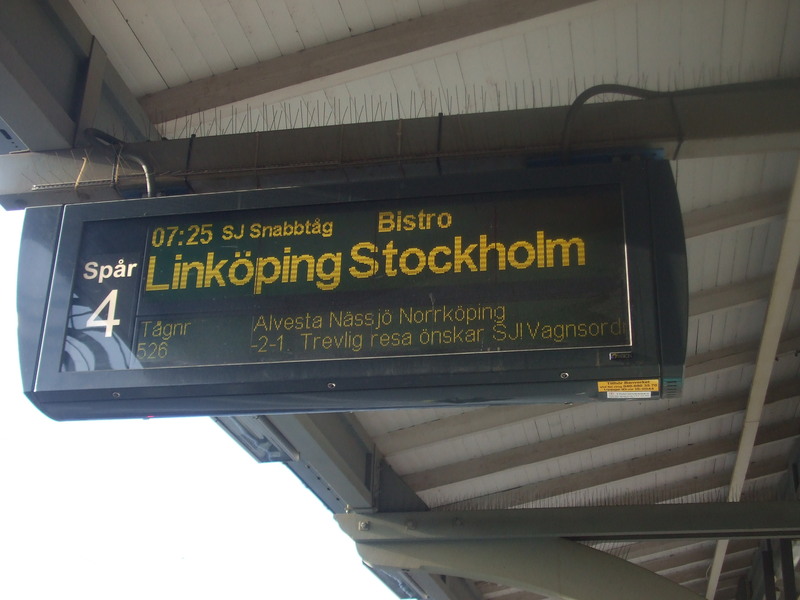 In the afternoon, we trek out to Sollentuna on the commuter train and Billy’s there when we arrive. It’s beyond the call of duty as he ferries us in the car from Sollentuna station, in the pouring rain, up to the outpost that is our last planned tour visit. Billy sits in the car and waits for us as we walk down a long road from the car park to the base building of an outdoor education centre, a forest school. Hanna meets us, and despite the dripping rain, is ridiculously cheery! She’s used to the outdoors, I suspect. There are no children here and, in all honesty, the group are all tired. Lucy does us all proud by firing questions to Hanna, saving us from all sinking into a soggy, tired silence: the week having caught up with us, not to mention the weather – which has been kind so far – and the trek out to Sollentuna after the travel out to Lidingö and back to T-Central in the morning. Later, at Medborgarplatsen, on Södermalm, Billy’s there again to meet us. He pops up at various transport hubs, his flip-up phone in hand, talking in some quiet conspiracy on it, ever faithful, to take us or guide us on our way. We eat in the Czech bar. A salute to Eva and Billy. Rich and I then go with Eleanor to Vasagatan to drink beer. Rich and I carry on and talk till the early hours, trying out the local brews on this our last night in Sweden. Stockholm is definitely a place to come back to. We talk about averageness, nonetheless. It is a theme of Sweden and we really can’t define it in terms of an English word that has both positive and negative connotations. We make our way back to the hotel in playful mood. Sweden is good enough. Early morning: we get up to catch the train to Stockholm. It is a popping out into the world again as we say goodbye to Gareth at Lund station. I know we, or rather I, have to kick in and be self-sufficient. We have ten minutes or so to find the right platform. Everyone here speaks English but the signs aren’t in both languages. I find the ticket office and march straight in to ask, whilst the others look to find the departures board. I think of asking in Swedish if they speak English, but I know they do. So, here on the train, which Gareth has warned us can induce some seasickness (high speed, the compensation for the bends is a kind of adverse camber effect of the carriages), we glide along out of Lund, north. I think of the train trip I once took through the Barcelona suburbs and of the place names I mentally recorded, and later wrote down, there. There’s a need to record this journey here. Hässleholm. We’re well into the pine forests now. Bitter train coffee. Sunlight splashing the pages. Four hundred miles or so to Stockholm. Four and a half hours. It’s just struck me how this is like a journey as long as London to Edinburgh, perhaps. Endless forest? What now would Kerouac have written?! Get into that mindset. Metatravel: travel about travel. This carriage is efficiently quiet. Alvesta: the station sits opposite a shimmering lake surrounded by trees. Approaching stations, the sound of the train engine cuts completely for ten or twenty seconds or so. We coast in on an otherworldly silence. Then the engines kick in again as we come to the platform. Where is Alvesta? I want to see the route we’re taking. Out of town, which passes quickly, the pines are interspersed with silver birch and other trees I can’t name. It’s flat, or as flat as the trees fringe will allow me to see, flatish. More lakes – great wide puddles of black blue. I try to capture these snapshots in words (metatravel) but don’t think I’m writing it well. A narrative of a journey. The landscape really is just trees, as Gareth said it would be, or mostly: trees and lakes and dots of wooden houses, some painted yellow or light brown, some stained deep brown. Gareth said we might see elk; there are some bears or wolves that wander down south, he told us. There really is an awful lot of wood, in trees, in this country! Nässjö: clusters of low-level houses round its lake; overhead wires above a stream of tracks, a small industrial spillage of a place. Quarried rock. Outside Nässjö there are slopes rising up from the train track. A smattering of houses. Are they really built at the angle of the slopes (are the ‘slopes’ slopes at all? ), as it looks like, or is it just an illusion caused by the sideways angle of the train carriage? This rolling and speed and writing on the go makes me feel a little unwell. The illusion of slope is what it is: careful study shows the pitch of the train to be quite steep – on the right, the buildings slope towards the train; on the left, just sky. Boxholm: another industrial outpost. Farmland. Rock starts to split through the landscape. Then trees, trees. Mjölby. The buildings are getting more urban, less pretty, though we’re still two hours south of Stockholm. Linköping, in the county of Östergotland. I find a map in Eleanor’s guidebook and see that there’s massive Lake Vättern out to our left but too far across the horizon to see. It stretches up from Nässjö, and then north past here. Linköping’s heavy industry surrounds the railway station, which smears into the low-rise city. It must be a city because of all the houses. What do they make or generate here? I can’t tell. Norrköping: more railway industry. Södertälje Syd: high up over a river valley. Sprawling car park of shiny white-topped ready-to-sells. Distant hills and stretching blue river. Look left, as we sit backwards, out towards the Baltic Sea, which isn’t in view, but I know it’s out there somewhere. Then, and then . . .
Stockholm. We pull in and it all feels somehow bigger than I expected. Why did I think of it as some twee little place? We meet Billy outside the main station, as promised, and he’s a man on a mission to get us to our hotel, as instructed. Billy, our quietly spoken Irish guide: what would we have done without him? Billy’s married to Eva, or as he alludes: she followed him home to Belfast once, and now he’s here with her. The hotel has rooms without windows. I think of the prospect of sleeping in a sort of cardboard box! Billy then takes us to the Pressbyrå shop to help us buy travel passes, and then on to Thorhildsplan where we visit the local Parkleken (playground). It’s got a good loose parts feel and a part-fence of low wire, but it still feels open, warm, friendly. The children go about the business of their play largely ignoring us. The staff there provide burgers for us and we talk of play and social attitudes and then leave them, goodbye and thanks. Billy talks into his flip-up mobile phone. He takes us on a tourist trail of Stockholm: off the bus at Slussen – the lochs between Lake Mälaren and the Baltic Sea; Gamla Stan, the old town with its narrow alleys, the castle and huge edifice of the Royal Palace; into the main thoroughfare of Drottninggatan, via the food hall – stalls and stalls of sausage meat, cheeses, fish, chocolates, fruit and vegetables. We separate as a group on our individual ways. Rich and I find ourselves on a search for a pub/bar. We walk up and down Drottninggatan but there doesn’t seem to be such a place. The street is jam-packed. Clothes shops, designer shops, sportswear. Then at the end we see what we think of, there and then, as the only bar in Stockholm. It is expensive beer (at around £7 for less than a pint each). It’s something I can say I’ve done though. Eleanor and Suzannah find us and join us for drinks. It would come to £30 for one person to buy a round of beer here! Later, we find Billy and the others – Lucy and Di – again, and Billy careers through the T-bana underground, at a pace, and we end up at Ropsten, where he takes us up and through a car park and onto a small waiting ferry. The ferry takes us to Eva and Billy’s island of Tranholmen: no cars and about two hundred inhabitants, which Eva (who meets us at the jetty with her dog) tells us was once the playground of the King. Eva and Billy’s house is a small, pale wooden gem that overlooks the Baltic at the west end of the Stockholm island archipelago (which, apparently, has some 24,000 or 30,000 islands in it, depending on who you ask, stretching out into the sea). We eat ‘surprise meat’, which turns out to be moose stew! We talk of more play and social attitudes. After dinner, pudding and coffee, Billy does two trips in his little motor boat to take us back to the nearest island with an underground station. He powers the boat across the lagoon and swings it round. The sky is a pale northern late blue (Eva said that in summer months, even here in Stockholm – a third of the way up Sweden – it doesn’t really get dark at all). Eva then drives us, on the other side, and drops us off at Danderyds Sjukhus, and we arrange to meet tomorrow. Rich and Di and I manage to find our way back to T-Central station and then, eventually, after some trial and error, back to the hotel. Back to Malmö and the Turning Torso tower dominates wherever you go. It’s a beacon, a positioning, a south or north, an orientation; a sentinel perhaps. Gareth takes us to the newly opened park, Kroksbäcks Idrottsplats, on the outskirts of town. Linn tells me it has the theme of adventure, though I can’t immediately see this. She says the park is laid out so that, in theory, the children can get around it without touching the ground: on rocks and logs and on a rope grid. It’s another open park with no fences. 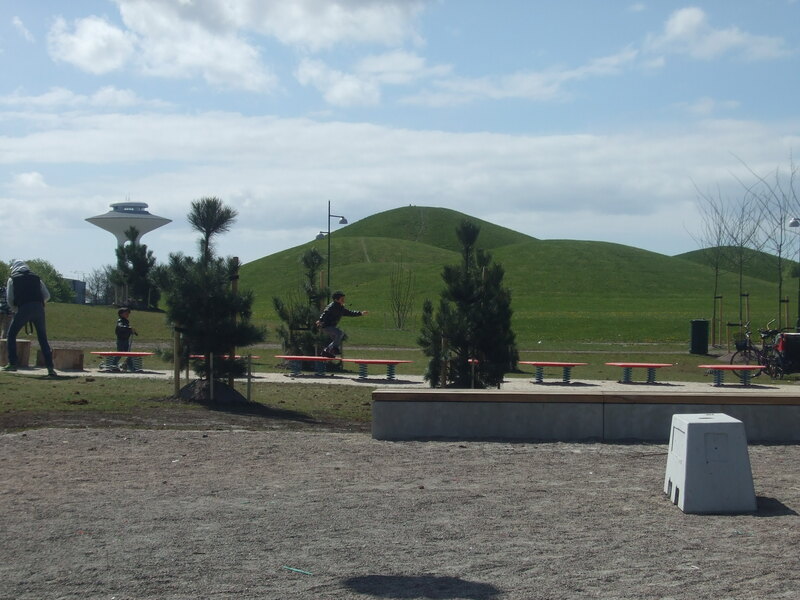 Looking towards the new Malmö Arena, there are huge svelte scoops of man-made hills. Around the corner, in the park complex (also not fenced in, and with an unfenced-in nearby school) is the wobbly football pitch! 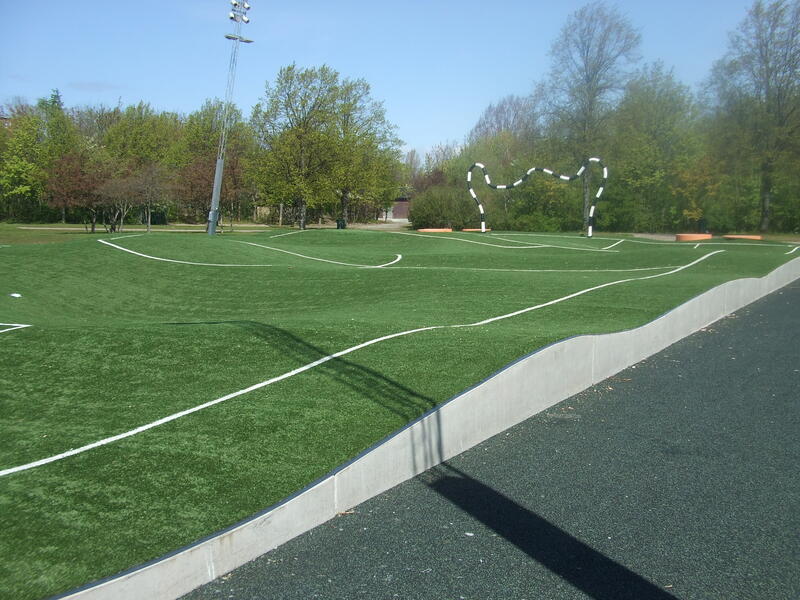 It catches our imaginations with its black and white looped goalposts and undulating astroturf. We borrow a local child’s ball to play for a while. 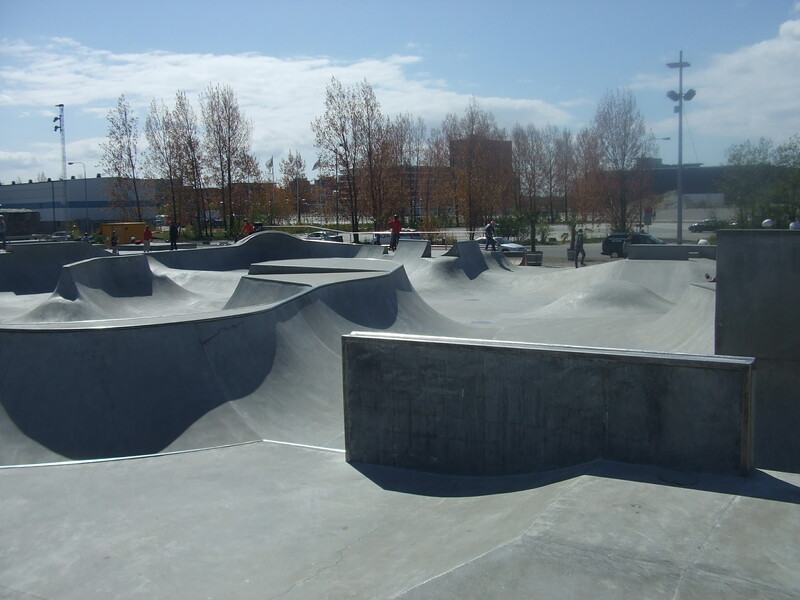 Back through Malmö and out past the continuous building projects by the old port (I presume) is the skatepark. There are younger children here, as well as some older ones, and one or two odd (as in ‘strangely put’) adults. One guy wears rollerskates and high socks with the word ‘Evil’ on each. He looks out of place in the children’s realm. I have a brief moment of thinking what it would be like as a child here. I think I could feel fairly free. None of the children pay us any attention. Perhaps that’s just indicative of this no-fence, open space culture, the ‘right to roam’ – Allemansrätt – way of things that Gareth explained to us (‘Go where you want, just respect where you are’). We drive around looking for lunch: there’s a Viking boat at the quayside (and Gareth jokes that the Swedes are planning another invasion of England! ); the old church; the new quayside glass buildings; ubiquitous red and yellow road signs. When we get out in what Gareth describes as a more ethnically mixed area for food, he searches for the falafel place he wants to take us to. Malmö city feels quiet. Is it because it’s a Sunday, or is it just the way this place is? Out north, we drive towards the forest that Gareth says is more the Swedish landscape, which stretches up, perhaps, towards Stockholm and beyond. We stop off at an open-air museum, take coffee at a windmill. It’s all calm, but I can’t write here. We sit around in the guesthouse lounge and maybe too many people stop the flow of words. I’m half-thinking of the trip to Stockholm tomorrow: the journey north, through the forestlands to the city called the Ice Queen. I like the idea of moving again, moving north, the farthest north on this planet: though we’ll be popped out of the comfort and luxury that Gareth and his family have created for us here in Lund. Still, Stockholm: a whole new place, a thriving place, new culture. Questions? Will the city have a quiet vibrancy, or will Skåne state be replicated up there in the Swedish way of things? (Gareth tells me about the Swedish propensity for a lack of aspiration, a comfort in being ‘average’ – lagom). Will the forestlands inspire? Will we cope in rarefied climes, thrown out into the wilderness? I want to find travelwords again. Perhaps they’ll come if I write as I actually travel: all my words so far here have come in the comfort of the Lund armchair. Words, people, differences. I meet a Dutch couple over breakfast – they’re staying quietly in a room somewhere downstairs. I make a huge assumption that they’re from Sweden, at first, but the old woman cups her hand to her ear, screws up her eyes to understand me, says they’re from Rotterdam. The man, a professor type, is jovial – his neatly trimmed beard, his professorial air, his academic clothes. We talk in the manner of tourists meeting over breakfast. Now I think of Linn and of nationality: she’s half English, Swedish, though she talks of how the Danes once owned this part of Sweden and how the people of Skåne treat Copenhagen as more of their capital, being just over the Sound – Stockholm being some 400 miles north of here. I wonder about mix of identity. Does she see any Danishness in her Swedish/Englishness? She tells me about the Swedish way of having interchangeable first names. She has a double surname – her father’s and her mother’s. 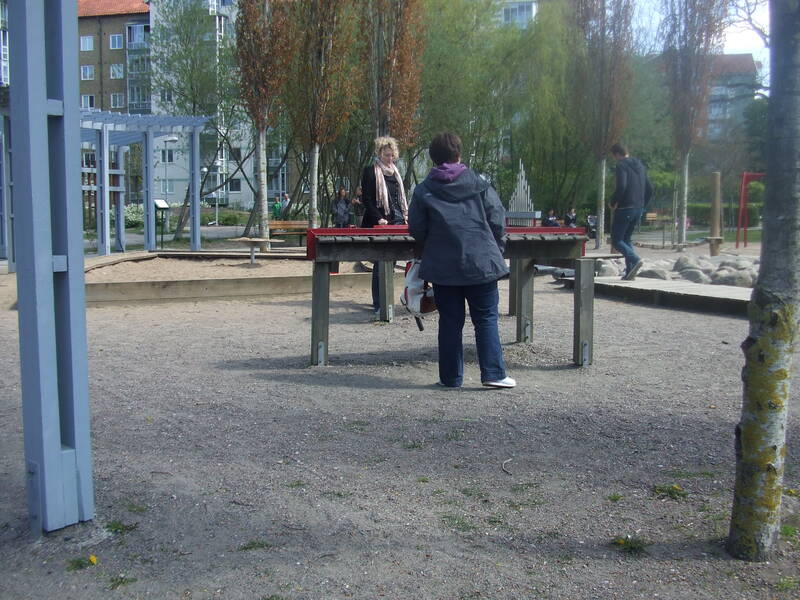 When we talk, later as a group, we reflect on the cultural mix we begin to see in the area of Malmö we’ve been to today. Linn talks of the resistance of immigrants to become Swedish, yet if they’re evicted from the country, a Swedishness becomes apparent. We talk of how the Swedes are seen as more uptight by the Danes and how the Danes are seen as more laid-back by the Swedes. Gareth points out the new building developments by Malmö port and says how he thinks Malmö and Copenhagen are beginning to merge. I think of all of this and of identity and of global spread. I think how, in maybe twenty or thirty years’ time, urban conurbations, races, cultures, ‘tribes’ will all be fused and interjammed more so than they are now. Will there be sub-tribes forming? Will the homogenous McCulture spread us all thin across the planet? Will there be pockets of resistance? Activists of tribal identity? Here in Lund, now, we’re all quiet in notebooks, gadgets, laptops, scrapbooks and words can start to come. This Swedish quietness of rebellion I asked Linn about last night, which she didn’t really answer, maybe won’t materialise in a tribal activism: the ‘anti-aspirational average’, the well-but-over-designed street and play planning (with its possible deficit of loose parts thinking), gives the Swedish children a contented play experience – think of the smooth concrete skatepark hollows or the playground mounds – but a lack of loose parts might engender a lack of a need for personal creativity. Averageness, albeit well-designed and thought out, abounds. Sure, there’s creativity in that design process, but when the need to rise up against a tide of homogeneity comes, there’ll just be a process of subsuming, not rebellion. Maybe this is what I was going on about in questioning Linn yesterday. The place may not need rebellion – what’s the point of activism if there’s nothing to rebel against? Thinking about ‘averageness’, it’s not apt enough in describing this corner of Sweden so far: that’s not to suggest a negative; it is a point of note on calm, edgelessness, tranquillity. 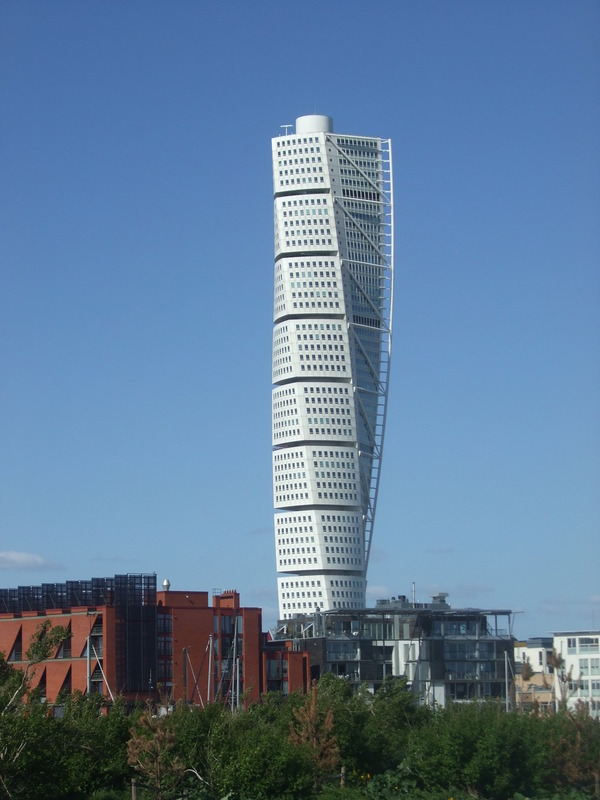 Only the Turning Torso tower (why are the signs at the port-side in English?) in Malmö exudes a decidedly unaverageness of being. It’s literally a stand-out affair. It dominates. From the country, far out north, Gareth points to the south as we drive: ‘There’s Malmö on the horizon.’ All you can see is the Torso, slim sliver at this distance, stuck up above the thin grey line of the curvature of the south. Every angle, close up, of the Torso is a fascination; every angle an oddness, a quirkiness, an inability to work it out. Onwards to Stockholm: average or truly Ice Queen? 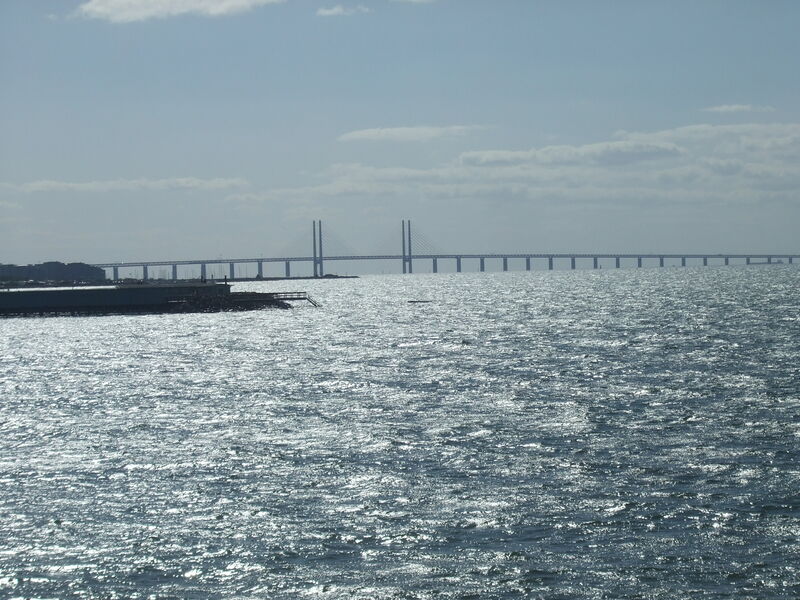 We’ve been talking about going over the Øresundbroen (the bridge from Denmark to Sweden) for a while now, but in the event it’s an underwhelming experience. The train track is below the road deck and, even with just the last vestiges of evening light still hanging in the sky, the view is not spectacular (the concept, for me, of building a huge bridge that spans the Sound is). 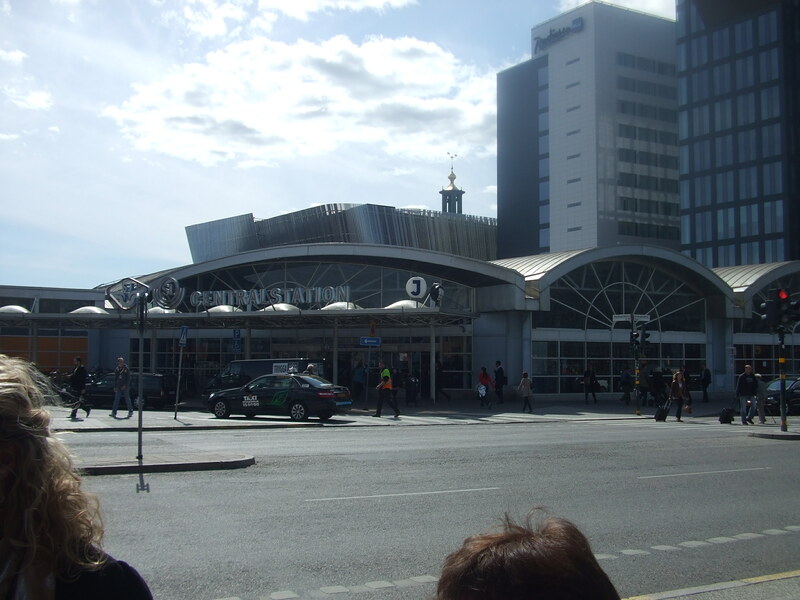 It’s no time before we pull into Malmö Central Station and then on to Lund. Difficulties will always arise when travelling abroad and this trip’s no different: Lucy’s first up the corridor of the train but we can’t figure out how to open the door between carriages. There’s a small picture with a hand on it, but it’s non-specific. We look at each other, but none of us know. Finally, Lucy (literally) pokes a man sitting nearby and gestures as to how to open the door. He waves his hand in front of it and it slides open. The symbol and the action bear no relation. At Lund, we fall up and out onto the main road. I sit and feel quite tired now. Whilst we wait it suddenly occurs to me that we’re in Sweden now. It’s always a small feeling of ‘how strange’ when stepping out into a new country. Gareth, who owns the guesthouse where we stay, picks us up. Everyone’s quiet, travel-tired no doubt, as he drives us through the equally quiet streets of Lund: a University city, he says, of some 450,000 students and only 25,000 local residents. He says it’s very quiet when the students go home. Even quieter than this? His guesthouse is along a residential road, off of what he says is the area where all the professors used to live when they were paid more than they are now. His guesthouse is warm and homely and he chats for a while before disappearing to attend to some pre-arranged business. Gareth’s wife, Karin, is pottering in the kitchen. Others said, later as we ate, thank you (to me) for getting us here. All I had was my little black notebook of information – I don’t feel I did any leading of sorts. Yet, this is what I have been today. At dinner we talk of this and that, as a group forming will do. Later, we sit around upstairs, lounge; there is laptop exploration, guidebook consultation, poking around on mobile phones. Today is a grace day: forming, arriving, finding out small things (milk is mjölk, not the pouring yoghurt in the milk-shaped carton in the fridge!) The day has now drained me – so much covered in sixteen hours or so: a buzz from one country, through another, to a third. Pristine efficient Scandinavian system; a tired car trip through quiet, empty student streets; empty of any concept of what this country holds for us, perhaps. Gareth, our host (and landscape architect), drives us round Lund after breakfast. He shows us a ‘fritid’ (freetime) after school provision, though it’s a Saturday and there are no children around. He explains it as a place where children do activities after school. So, not really ‘freetime’ after all (Linn, his daughter, doesn’t know why they’re called this either). It has the feel of a kind of natural adventure playground space, though without the adventure structures. 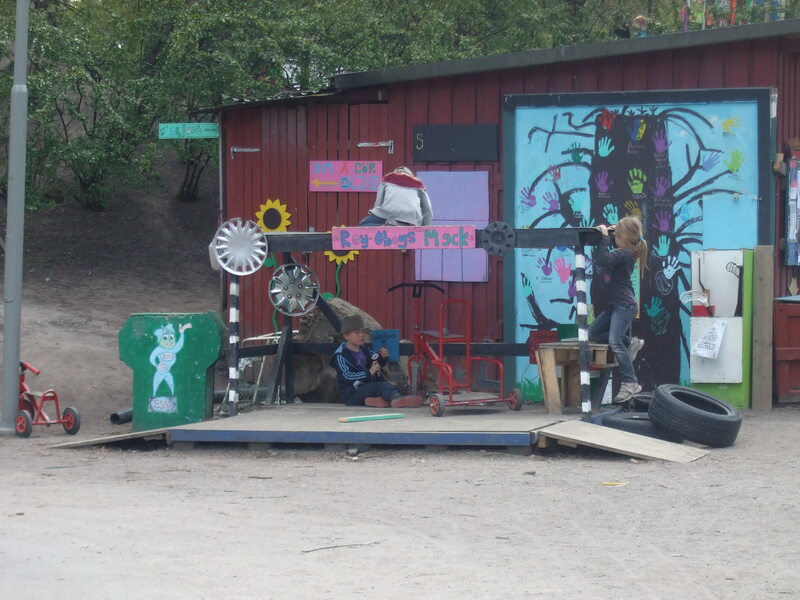 It’s an outdoor space where children are led in creative pursuits – painting, building wooden structures, etc. It’s our first experience of anything in the Swedish scheme of things with children. Gareth narrates a stream of useful information all day and tells us how children don’t go to school until the age of six and there isn’t any pressure to pass exams: rather, it’s a continual monitoring of progress, and everyone graduates. 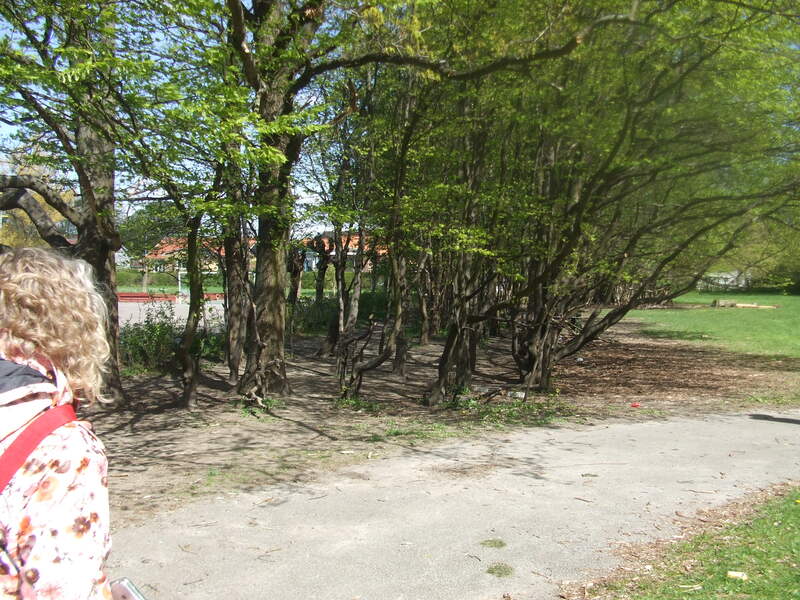 He takes us to a school that’s on a housing estate and with a local park and green next door. There are no fences around the school. There’s an unfenced pond designed into the school grounds – something that probably wouldn’t happen at home. There’s a dirt zone under the trees that, effectively, acts as the boundary, but it’s a nominal boundary. I like the idea of no containing space, but thinking about it, how much would Englishness kick in and cause an anxiety of needing to ‘keep children in’, ‘control’, ‘protect’, any or all of the above, with this sort of set-up back home? In Malmö, Gareth takes us to some of the parks – the city is known as the Park City – and the themes for each are, perhaps, now nicknames: ‘the Rainbow Park’, ‘the Spiral Park’, ‘the Sound Park’. I think I was expecting more of these places. 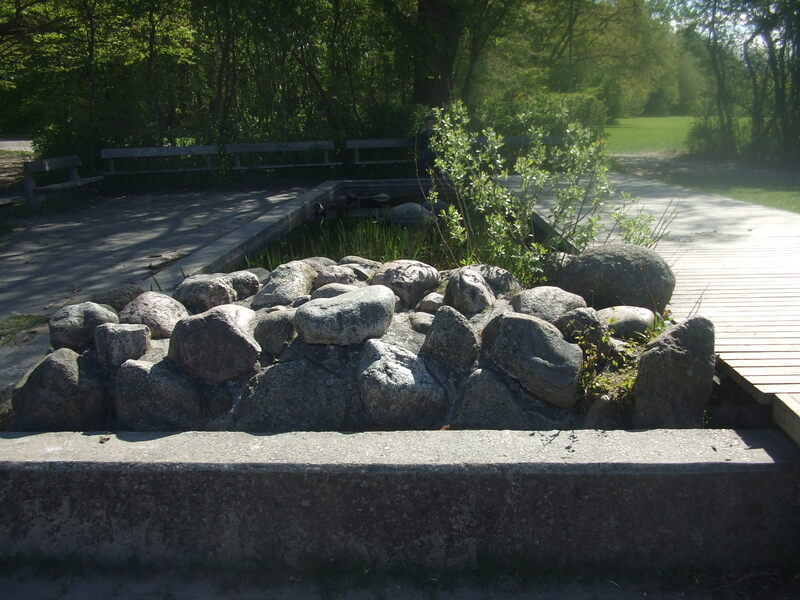 They’ve been designed, for sure, but we find out later from Linn that the Rainbow Park was designed on a whole narrative of light and dark and trolls and forests and suchlike. To me, it has a rainbow slide . . .
but I didn’t connect the blue mounds as representing ‘river’, the white shapes as ‘mushrooms’. I wanted to put a few planks in the place and walk away, watch the way the children might place them between the designed mounds and create their own play narratives. The Spiral Park I’m not inspired by at all. I stay in the van and talk with Gareth. The Sound Park . 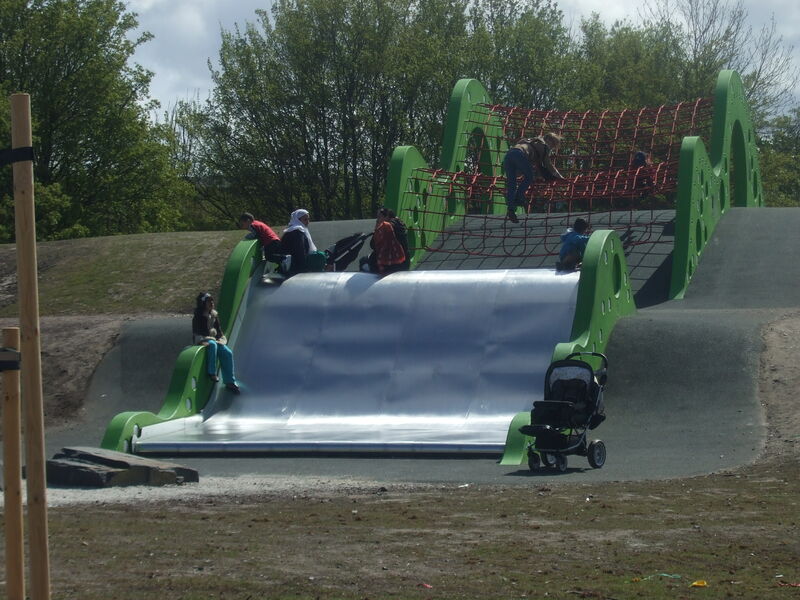 . .
has an initial novelty value, but I’d imagine once the children have jumped on the noisy pads or tried the whispering dishes, then they’d go off to play in the trees or on the swings – which is what the few children who are there are doing. One child climbs the harp instrument arranged in the part-fencing at the edge of the park. This is not a barrier, more a vertical plane on which to place things. In Malmö’s Lilla Torg (square), we’re left to fend for ourselves as Gareth goes to park the van. We can’t find the bakery café he recommends to us: us incompetents in a foreign land! We realise we don’t have a mobile contact for him. Sweden is probably the easiest country in Europe to get by in, in language – everyone speaks English. So why is there this reticence to ask the locals where to go? Eventually we find Gareth and he discovers that the place we’re looking for has moved and it doesn’t exist any more. So, we’re not quite as incompetent as first seemed. Malmö seems unrushed, as does Lund, as perhaps is the rest of Sweden. It doesn’t feel like there’s that many people in the country – there’s not: ten million across a huge area. 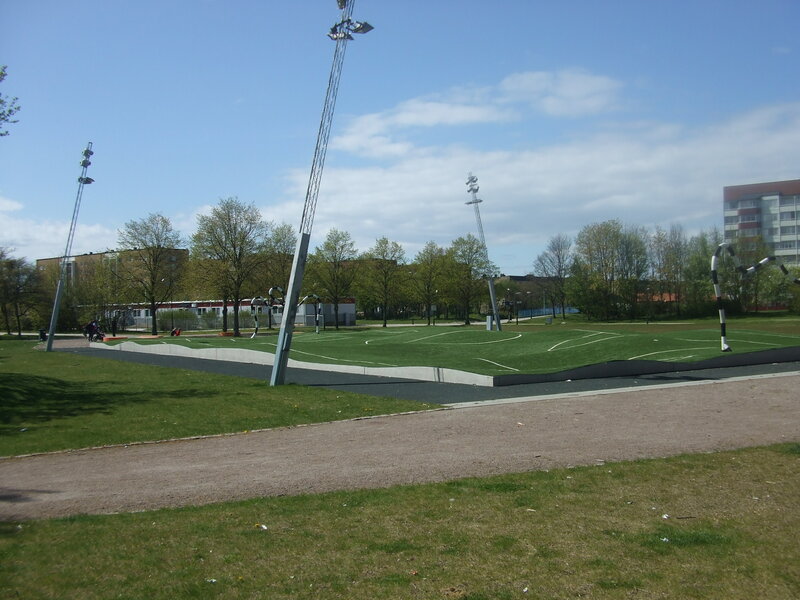 The spaces in the cities of Malmö and Lund feel sparsely populated. Everything feels well-cared for, kept, though not obsessively so (Gareth said the grass in the gardens of the allotment huts we walked through was cut but not shorn, left a little wild). Bicycle riders give cursory attention as they cross roads from cycle tracks, and cars go about their businesses in no seen aggressive ways. We drive through Malmö’s streets and I have a feeling of there not really being an ‘edge’, not like in other big cities (this is Sweden’s third city). That edgelessness is not to suggest a negative. The city comes with a reputation, according to Gareth and Linn, of having immigration issues, but it doesn’t present as a feeling or show this to me. Gareth takes us a little way out to the coast, at the harbourside. I see the mad mischief of the Turning Torso building from various angles as we get closer. It’s the focal point of the regeneration area. When we’re close by, walking down the quayside, I keep looking up at the twisting bizarre apartment block, not really getting my head around it. From one vantage point parts of three of its façades are all facing the sea at once. It’s more than odd. I wonder how the architect could have come up with such a drawing – I want to straighten it out – let alone how the engineers actually managed to build it. Gareth takes us through the housing complex, which he describes as an architectural competition. There are empty streets, not designed for cars, with houses all different, clad differently. He turns into an alley and we come out in a courtyard: three or four storeys of wooden railings surrounding a designed marshy pond and hardstanding area. Light falls in on one side and casts a soft shadow. Two women sit on a decking with two children. They’re relaxed and welcome us in. I look up and around: it’s like a square version of Shakespeare’s Globe. I imagine the galleries filled with people looking down on the courtyard play. We drive out of town, soon on the road north to Lund, red and yellow garish signs that must attack the senses of drivers. Earlier, I stood on the grass at the shoreline in Malmö and looked out at the distant Øresundbroen . . .
and, farther out, there was the edge of Denmark. I realised, as I walked across the grass towards the shore, that sixteen years ago, stood somewhere up on the Danish coast, I looked out at Sweden over the water and thought to myself: someday I’d like to go there; someday I will. Here I was, sixteen years later – strange, odd, how things work out sometimes. Back in Lund, Linn comes upstairs as we sit around the communal lounge talking about the day. I can’t resist asking her: how do/would the youth of Sweden rebel, brought up in seemingly safe and agreeable Lund? She doesn’t really answer my question and I’m not sure it’s understood, in social comprehension, despite her fluent English. She says she prefers the English education system of ‘choices’. Later, I think she must mean A-levels or suchlike. In Sweden, apparently, children learn what they must learn (and everyone graduates now). Preconceptions of Swedish education start to crumble at the edges a little. 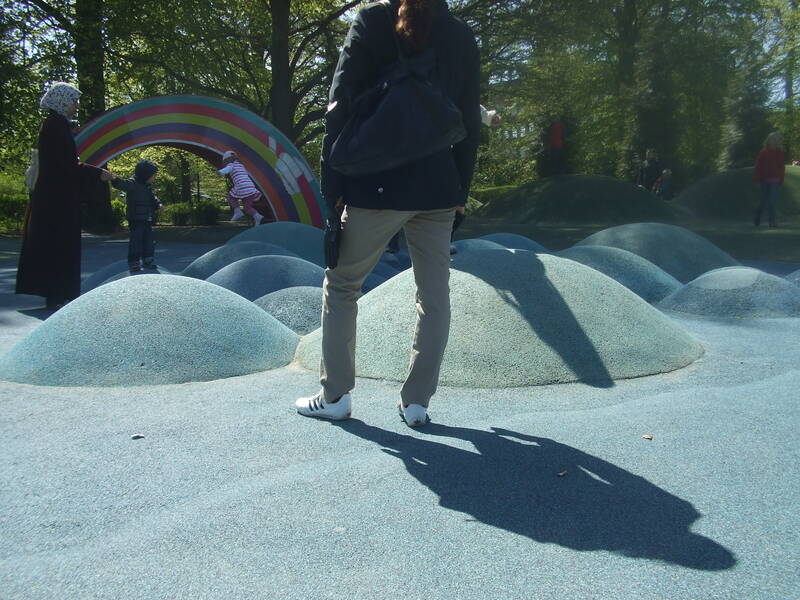 There are playable spaces in designed parks and public spaces in general, and children are maybe not deemed as socially unacceptable here as they might be back home, but I have no idea about how Swedish education, as a system, works insofar as what it creates of children. Perhaps we’ll find out later in the week. 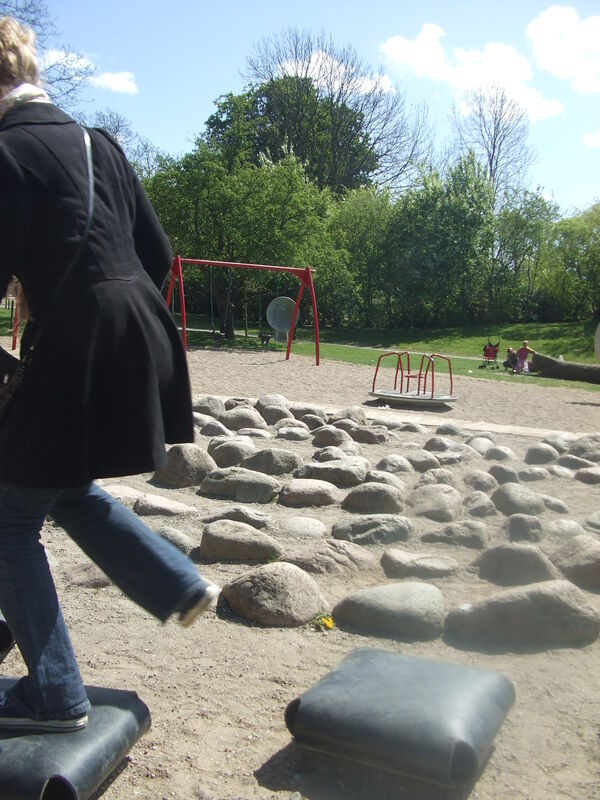 I recently travelled to Sweden on a playwork study tour. I’m in the process of typing up my notebook from the trip, but I’d forgotten that I’d already written up the overview below. So, in the spirit of dissemination of information, here is that overview. Further notes will also be posted in due course. I went to Sweden with the expectation that there would be cultural (positive) differences in the way that adults there interacted with children (compared to what I’ve often seen in the UK). This may have tempered my observation and reflection. However, that said, my overall feeling is that there is something positive about Swedish attitudes towards children. What is that something? In the time we spent in Lund, Malmö and Stockholm, I personally didn’t observe a single instance of children being treated without a degree of respect (in parks, the skate park, in the streets, on public transport – trains, buses, underground, in other public places like supermarkets, etc). Children were communicated with calmly, and listened to. Only once did I observe a child being talked with in a public place, by an adult, in a way to suggest they change what they were doing (a kindergarten worker, on the train from Sollentuna, who had a very quiet word with two children who were playing on the support pole and who accidentally brushed our legs). Only once did I observe an adult becoming a little frustrated with the children around her (one of the teachers at the I Ur Och Skur Utsiken Skola – Outside School – on Lidingö island, Stockholm). She was teaching directly and the children seemed to have understood the point of the lesson and were more interested in eating berries (which she was quite happy for them to do anyway). Perhaps my observations serve to highlight that we only saw a small cross-section of life in Sweden. That said, what I did observe was drawn from educational institutes, play settings, the ‘social competency’ of children being out and about on public transport, and children out on their own in parks or on the street. The flipside to this observed general ease between adults and children, this Swedish democracy inherent in the culture, is – potentially – the ease with which the children accept a place within it all. 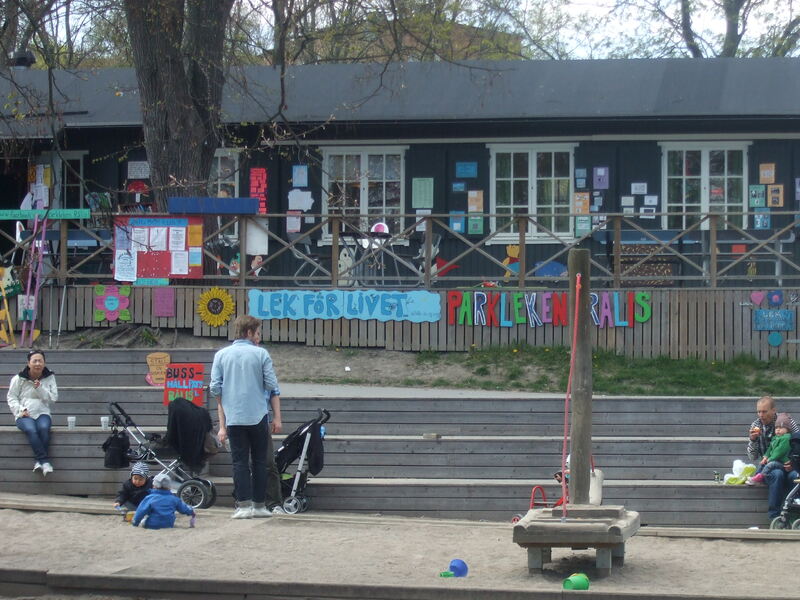 That is, as I tried to root out of various people on the tour (our guesthouse host’s daughter, in Lund, with her Swedish/English parents; staff at the Parkleken playground in Stockholm; staff at Sköndalsskolan ‘youth club’): How do Swedish children rebel? 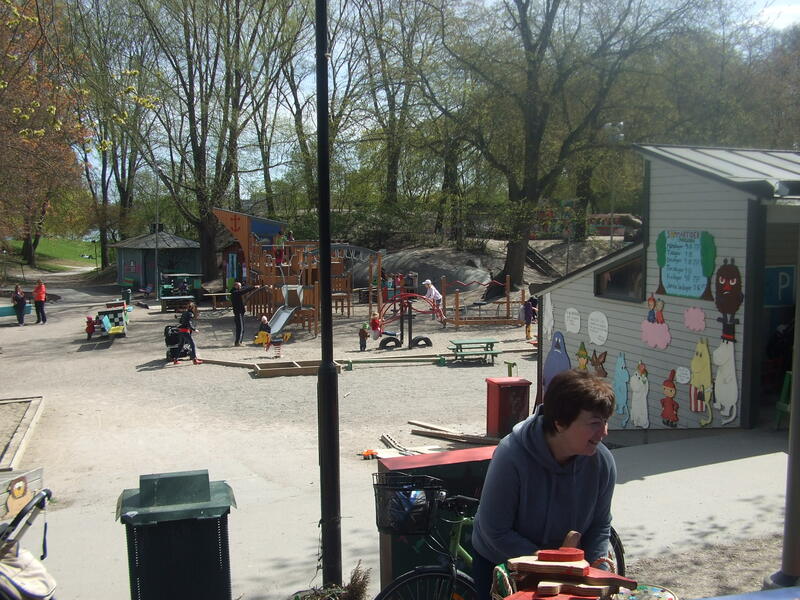 What do playground and club staff do if there’s risky play or conflict going on? The answers were matter-of-fact and delivered in a way that suggested that these things didn’t really go on. Risky play happens, sure (I walked through Parkleken and saw a child hanging upside down on a bar by the backs of her knees), and children were walking on top of their ‘bike garage’ . . .
What am I trying to conclude with all of this? Swedish democracy, developed as a way of interacting and ‘being’ from an early age, and part of the fabric of the culture, is definitely in evidence. It makes for a relatively calm and conflictless inter-generational society (at least, in the limited parts of the country I’ve seen). However, what’s the cost of this to the individual? After listening to a presentation at the University in Stockholm, and on further discussions with Eva Kane, from the University, I was interested to learn about the move from 19th century ‘social training’, for poor children, to modern-day ‘social competency’. This can be clearly seen in practice when travelling the T-bana underground or on the buses: small groups of young children are accompanied by a couple of adults, or older children travel on their own. Eva also explained that the term ‘socialisation’ has very different connotations in Sweden to those of the UK. 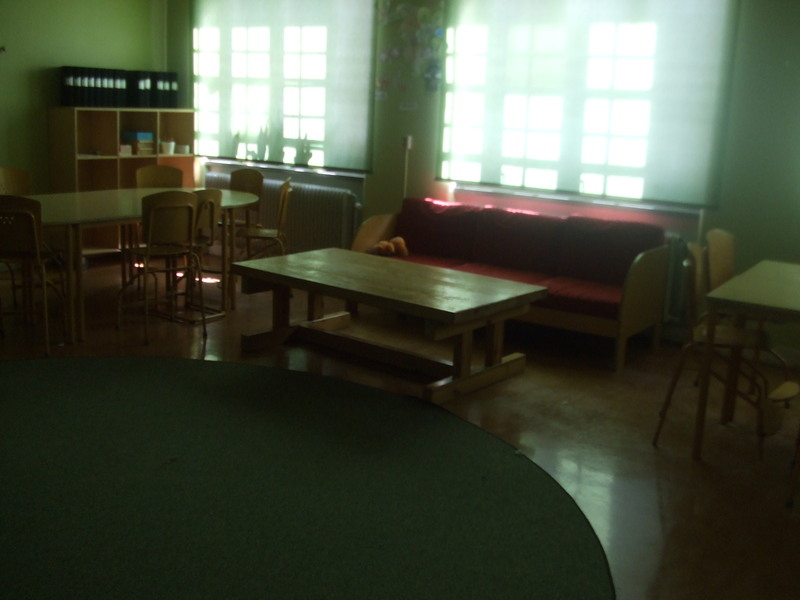 In the former, as I understand it, children are actively encouraged to be part of a democratic culture and country (you can see this, for example, not so subtly, in the laminated sheets pinned to all the classroom walls at Sköndalsskolan – their school motto of ‘Responsibility, safety, participation, conducive to work, respect’; more subtly, you can see this positive socialisation in the way children are listened to and trusted). 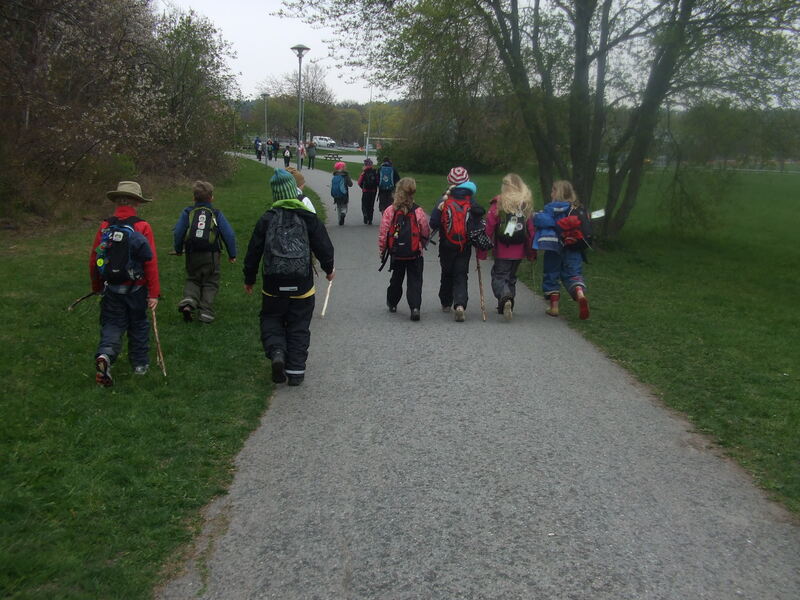 Walking with the I Ur Och Skur Utsiken Skola on Lidingö, I was interested to see how Tim, the group leader, walked ahead when they reached a road (albeit not a busy road) and the children were trusted to cross on their own as they followed. How often would this happen in play settings or schools in the UK? ‘Socialisation’, here in the UK – from my experience – is about adults’ perceived necessity to mould children to fit into the ‘system’, ‘the rules of society’, the way it is (the adult world). 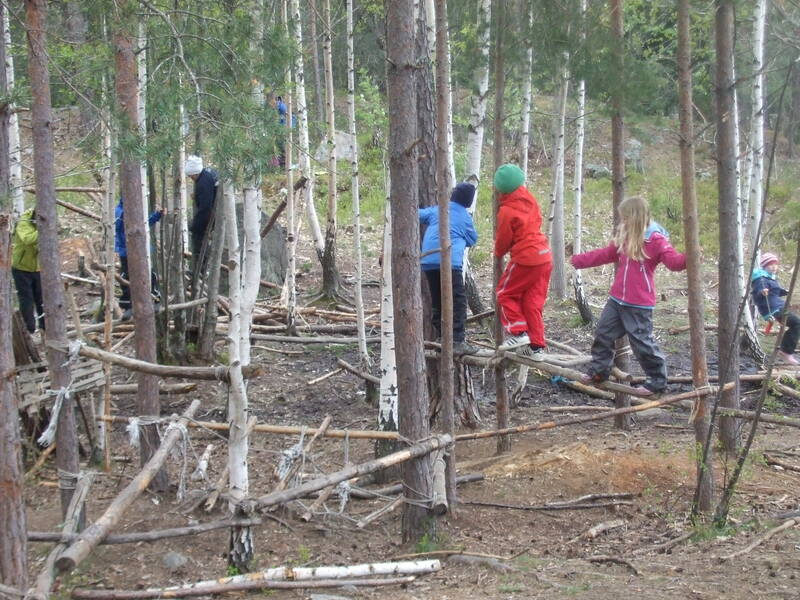 In Sweden, there seems to be a subtle difference: children are active players in that society. Children seem to be given due respect. 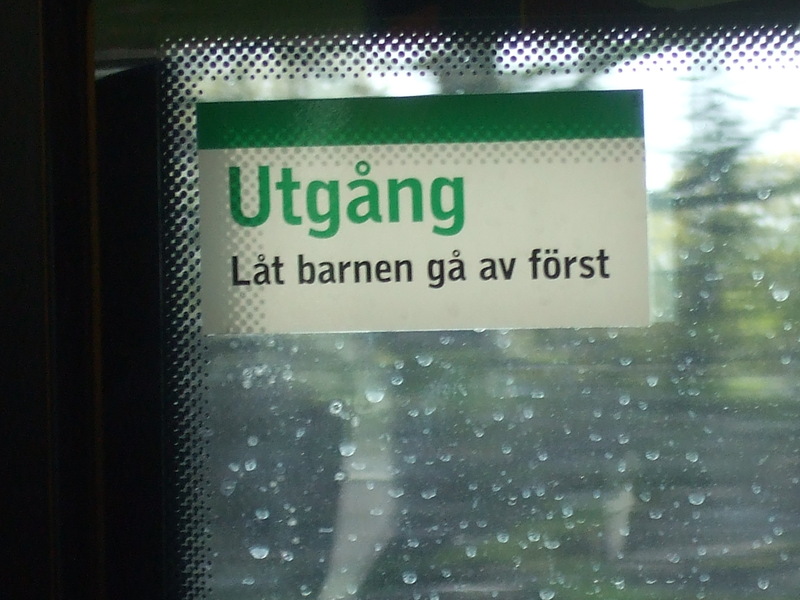 On the door of the bus from Lidingö was a sign, at adult eye level: Låt barnen gå av först – let children get off first. A final reflection, for the time being, on Swedish culture: our host in Lund, Gareth, explained the concept of ‘averageness’, that being his translation of the Swedish word ‘lagom’. He’s fairly fluent in Swedish, though he’s English, and this, it transpires, appears to be significant. This discussion came about as part of conversations around rebellion, expression and aspirations. Gareth explained that the Swedes, in general, express no real discontent or need for distant or unobtainable aspirations. They seem, to him, to be contented with the status quo of the ‘average’. Later in the week, I asked Eva about this ‘averageness’. She immediately put a different spin on it (perhaps she’d heard of the ‘averageness’ translation before and wanted to put the record straight). Eva said that ‘lagom’ comes from an old Viking phrase of several words condensed down. It means (as I understood the conversation), essentially, ‘good enough’: that is, if everyone around the table at a Viking meal had enough to eat, then it was good enough. In this sense, Swedish culture (from what I’ve seen), and Swedish adults’ attitudes towards children, are ‘good enough’. This is a positive – though perhaps there’s a need for an English phrase that can express the positive sentiment without sounding slightly negative, as ‘good enough’ has always done to me. I do understand the link, in our line of work, to Winnicott’s ‘good enough mother’, that the child is given exactly what is needed, but the phrase ‘good enough’ has never felt good enough to me. I digress. Sweden feels comfortable, democratic, an easy place to be. I do wonder where the ‘edge’ is though and, from that, I do wonder if there’s a need for an ‘edginess’, a rebellion. Has Sweden got it right? Or is it floating along, creating compliant young adults who will be compliant older adults? Is the social competency of Swedish socialisation a model of peace and well-being, or is it a very, very subtle suppression of otherwise free expression? My own cultural upbringing has taught me to exercise restraint and be a little hesitant in totally embracing other societal models (hence the questions about rebelling). I do like Sweden and I will go back there. I just can’t work out the exact nature of what I like the most, and whether I should let myself feel this way! 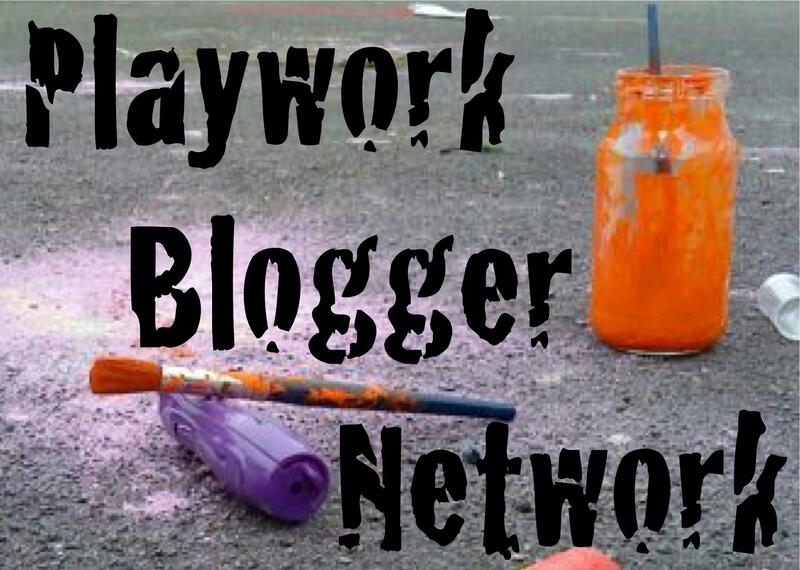 Click here, get playworkings by email. 38,197 its - no squibs or returnsies! © Joel Seath and Playworkings (2012-2019). (i) Joel Seath asserts his moral right to be identified as the author of these writings, except where stated otherwise. (ii) Unauthorised use and/or duplication of any material on this site without express and written permission from this site’s author is not permitted (so far, so standard blurb); the author is open to fair use of portions of this site’s material, provided the proposed user and the author have a written communication first. (iii) Excerpts of up to 100 words may be used for the purposes of citation or review, provided that full and clear credit is given to Joel Seath and Playworkings with appropriate and specific direction to the original content. (iv) Basically, do as [what any reasonable person] would be done by, and be excellent to each other. * (v) There is no Clause (v).